Digital Content Curation Workshop – Collabor8now! I’ve just finished updating the course material for what will be my second workshop on mastering Digital Content Curation. The next workshop starts in London on 25th September. Details on the UKeiG website. There are still a few places left if you book soon. I should perhaps clarify that I’m aiming this workshop squarely at knowledge and information professionals, bucking the trend where most information on this topic appears to be aimed at sales, marketing, brand management and publishers. The core elements of the workshop are probably more accurately described as “personal knowledge management‘, i.e. the processes, disciplines and competencies required to dip into the raw, unfiltered, context-free information that bombards us every day and extract meaning and actionable insights. The ability to provide relevant and decision-ready information is becoming a valuable commodity in its own right, and many organisations are beginning to appreciate the roles and skills of the people who understand the specific information needs of their information consumers and can provide it in a timely and effective manner. 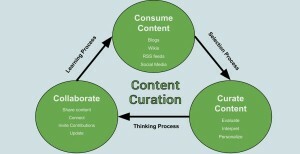 Effective curation requires technology and tools to find, filter and validate content at the speed of the real-time web. It requires knowledge domain experts who can interpret and add insight to the content they are harvesting. It needs people who can utilise the power of networks and networking to source relevant and reliable information. In short, these are the essential skills of the 21st Century knowledge worker. This workshop will focus on developing these skills. If you can’t make the workshop on 25th September, it will be run again by TFPL on 13th November. Details on the TFPL website. If you’re still confused as to whether “Content Curation” is something you should know more about, here’s a slide deck that might explain. Previous Post Social Network Analysis: making invisible work visible. Next Post Gamification: making work fun, or making fun of work?